Fish with Carrot and Orange!! 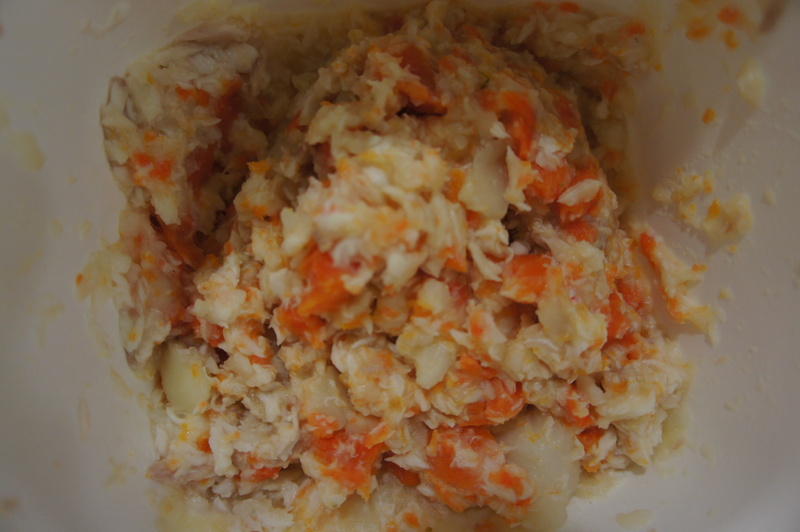 First, steam the chopped carrots and potatoes until tender. Steam is better than boiling coz it will preserve more of the nutritions as compared to boiling method. Sorry I forgot to take picture for this step! Heheh.. But I guess you all know how it looks like, kan!! Next, put the fish in a dish. 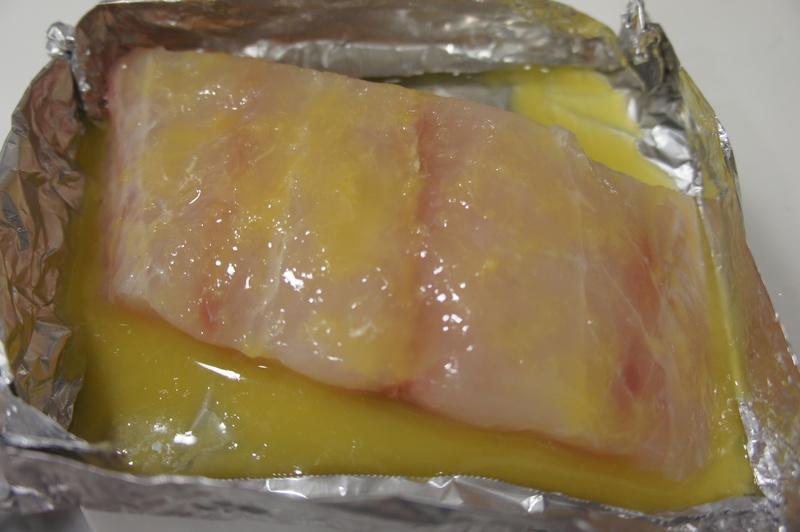 Here I sure red snapper fillet. Sedap kan ikan merah! But I bought the fillet version of it coz I doubt my skills to debone the fish 😀 Sebelum Bella tercekik, better I just buy the fillet version, confirm no bone!! Pour over orange juice. You can just get an orange and squeeze it over the fish. Better cause there will be no sugar added, more natural!! 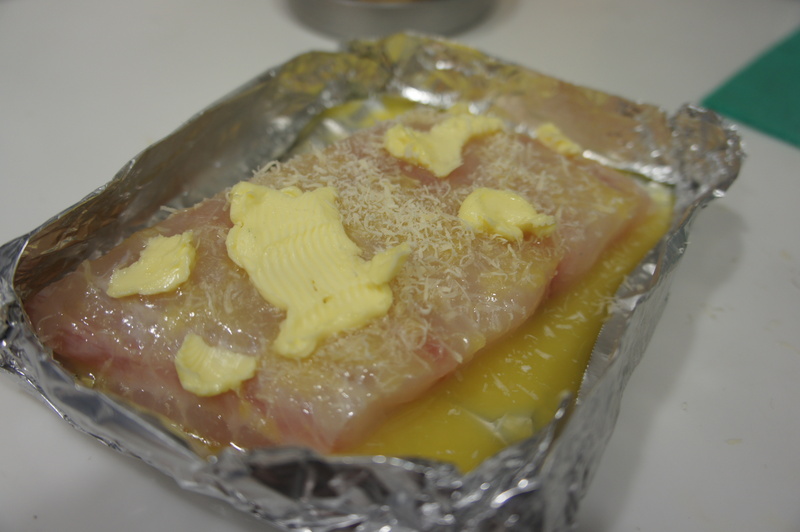 Sprinkle with grated cheddar cheese.. and dot with butter. In this case, I used unsalted butter..
Cantik kan!! Bau pun super yummy!! B’s daddy thought it was his dinner!! 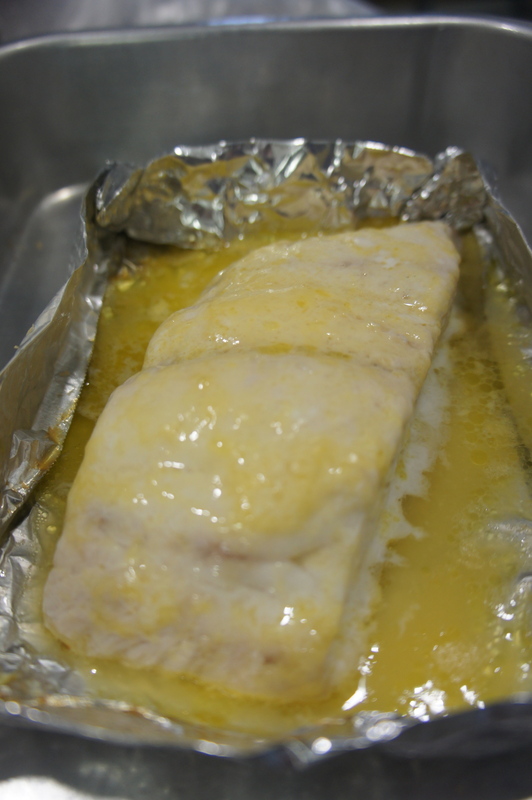 Haha.. Then I flake the fish with fork.. later add the steamed carrot and potato to the meal. You can blend to puree or just mash it until it softens..
For Bella, since she already has 8 teeth, I just mashed it.. It tastes really nice, fresh fish without the smell!! A little carbs from the potatoes and vitamins from the carrots 😉 Give it a try mommy! Posted on May 28, 2012 December 2, 2012 by Dr Halina Mohd YunosPosted in MommyhoodTagged recipe, solids. Previous Previous post: B’s First Haircut..
wah! adult pun boleh try nih…….. tq dr. halina………. Dr. Halina patut post little B`s pic how she realy like the food. Yummy sgt. Still want to know how B`s look like after haircut. 6 month xblh mkn ikan lg kut. my bby dah nak 9 pun still blm bg ikan. sbb paed ckp after 9,br blh..
already try it but with ikan tilapia… yummy, my kids love it..
mmg seronok memasak utk liltle baby..masa tu mereka masih tidak tahu memilih…tp bila dh jd toddler susah betul nak kasi makan….sbb dh pandai pilih….takmo sayur…takmo ikan…nak ayam goreng jek. pening kepala ibu dibuatnya…dh jd masalah susah nak “membuang” aka sembelit.. susah hati tgk anak mengerang sakit sembelit… camner ye doc?? Dah try prune juice? Letak honey sket bg kurang masam..
looks delicious … thanks for the recipe, simple n healthy. Wanna try to my bb later. lucky you!! my 8 months refuse to eat anymore…she will be excited for 1st/2nd spoon and totally will not even open his mouth….she wanted things to be eaten in her hand….any advise?? Let her eat on her own.. She’s probably at the stage where she wants to feed herself..
tq doc…i usually give her fruits in hand….but when she get bored she ‘help’ me ‘mopped’ the floor with the fruits…or..’help’ me to exercise by ask me to pick it up from the floor….i know is their level of motor skills right know..repetitive error..but my motor pulak almost jammed..lolz… btw thanks…really admire how bella love eating! have u ever considered the baby-led weaning approach? google it on the net. she’ll surely find mealtime is more fun and exciting than before. for some good recipes refer to gill rapley’s cookbook. i tried it out with a few twists here and there. sedap!!! sampaikan atok, nenda pun kata pasni dorang pulak nak try out the recipi utk meal dorang plak. thanks doc!! kalau sy masak tuk baby sy dok, dgn sy pon mkn skali , it ;ooks so yummmyyy!!! I wanna try orange too in my baby’s food. Sebab I want him to get the vIt C. Asyik flu je dia ni. I dah increase my vit C intake too. Thanks for this recipe. mcmana klu xde oven or microwave kat umah? still blh msk guna dapur gas ke doc? My daugther loves it sooo much!! so far ive tried all ur shared recipes and she loves it all!!! Only that she doesnt have teeth yet, so the bolognese recipe will have to wait. Thanx!! !